In completing this profile of the iPic Westwood as our Cinema of the Month for June, we were reminded just how important it is to avoid one’s own preconceptions. When we set out to cover the iPic Westwood, an upscale cinema in the Westwood neighborhood of Los Angeles, we reached out to the theatre chain directly, as is appropriate in such instances. We also contacted iPic’s public relations agency multiple times and were assured that details about the iPic Westwood would be forthcoming. Having not received a response after some time, we were eventually informed that Hamid Hashemi, the founder and CEO of iPic Entertainment, wasn’t fond of trade publications like Celluloid Junkie. Rather than the informative and relatively promotional pieces our Cinema of the Month posts tend to be, we were told Hashemi was afraid he might be giving away trade secrets to his competitors. Maybe he has been burned by other media outlets during his more than 30 year career as a cinema operator, and thus assumed CJ might do the same. Hashemi started out with a single Southern Florida theatre in 1984 and in 1988 began building Muvico Theatres. By 2006 the chain had grown into a noteworthy circuit with 13 locations in the United States pulling in $120 million in revenue. After a public falling out with his investors in 2005, Hashemi parted ways with Muvico and immediately launched iPic Entertainment with the intention of opening high-end, luxurious cinemas. Like Muvico, before the chain was sold to Carmike Cinemas in 2013, iPic Entertainment is headquartered in Boca Raton, Florida. With our publication deadline looming, and June quickly coming to an end, we decided to stick with the iPic Westwood as our Cinema of the Month and cover it the old-fashioned way; actually show up in person to do a little fact gathering. After all, we thought, how hard could it be to cover some upscale cinema in a major modern metropolis? In this day-and-age, such venues are being opened at a breakneck pace by the likes of Arclight Cinemas, Cinépolis and Landmark Theatres. To be sure, there was no difficulty in getting the scoop on the iPic Westwood, however we walked away from our visit realizing our preconceived notions of the theatre were dead wrong. When it comes to a “high-end” or “luxury” cinema, iPic has chosen to set the bar extremely high, at least at their Westwood venue. 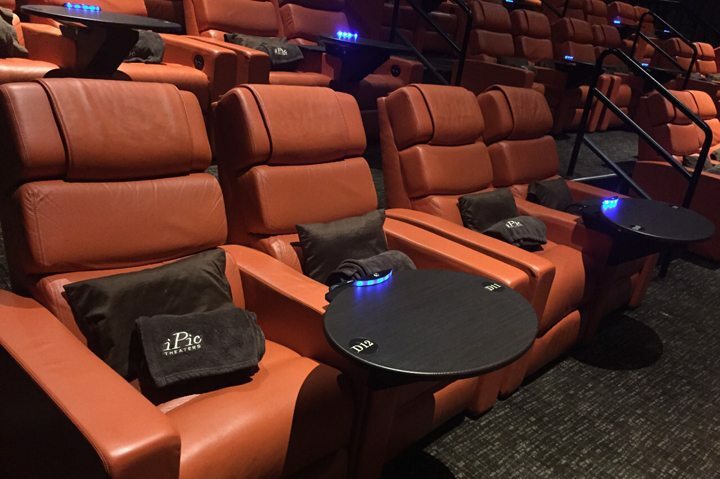 The iPic Westwood opened in May of 2014 as the company’s 10th location. The original theater occupying the location on Wilshire Boulevard was opened on May 23, 1972 by General Cinema (GCC) as the Avco Center Cinemas, a three screen complex whose main auditorium had roughly 1,100 seats. The theatre built a solid reputation as one of the better cinemas in Los Angeles. 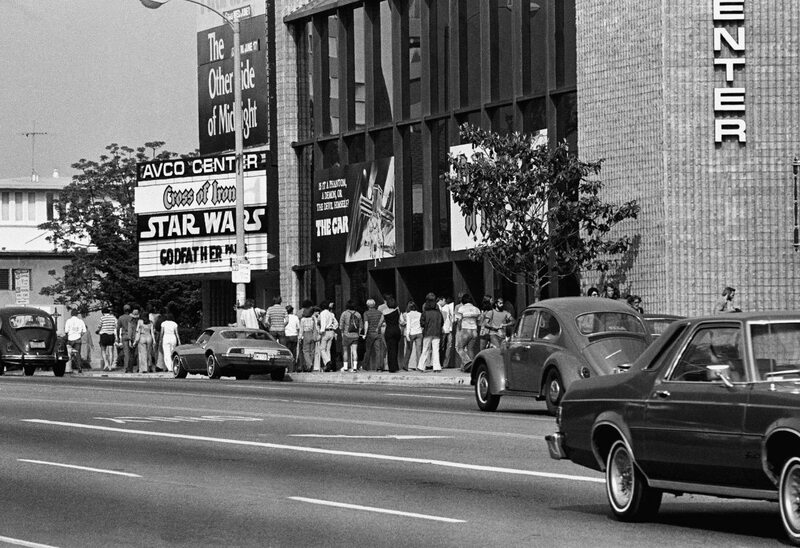 It notably opened all of the original “Star Wars” films on 70mm and was the first theatre in L.A. to install THX sound. In fact, J.J. Abrams, who directed last year’s “Star Wars: The Force Awakens”, has such fond memories of seeing “Star Wars” at the theatre when he was 11-years-old, that he gave “Episode VII” the working title of “AVCO” when he began filming the sequel. In 1993 GCC broke the hearts of many Angeleno cinephiles when they split the main auditorium into two smaller houses, turning the cinema into a four-plex. AMC took over operations of the multiplex in 2002 after GCC filed for bankruptcy. In December of 2011 however, the cinema was shuttered after the circuit couldn’t come to an agreement on a lease renewal with the Avco Center Corp.
iPic spent two years and millions of dollars transforming the four screen Avco into a six auditorium complex. While the original configuration of the theatre gave it 1,713 seats with screens that had anywhere between 328 to 551 seats, the iPic Westwood has slimmed down to 425 seats in layouts that range from 44 seats in the smallest auditorium to 108 in the largest. Unlike the Avco, which was often used by studios for media and research screenings, the iPic is more appropriate for intimate events such as small awards screenings or group video game competitions. But we’re getting a ahead of ourselves by talking about seats without going into detail about how patrons purchase tickets and what is included with the price of admission. Like many circuits these days, iPic has a loyalty program which allows for both free and paid memberships, along with a points system enabling customers to qualify for higher levels. The basic Purple membership is free and includes discounted admission as well as food and drink specials on Tuesdays. The Sapphire membership costs USD $29 annually and provides priority ticket purchases for new releases, a free birthday ticket, a free anniversary dessert, member events and the ability to earn points toward free tickets. Gold and Platinum membership plans are also available for more frequent moviegoers. Tickets can be purchased at the box office, though according to the “concierge” we spoke with more than 90% of patrons purchase tickets online beforehand. 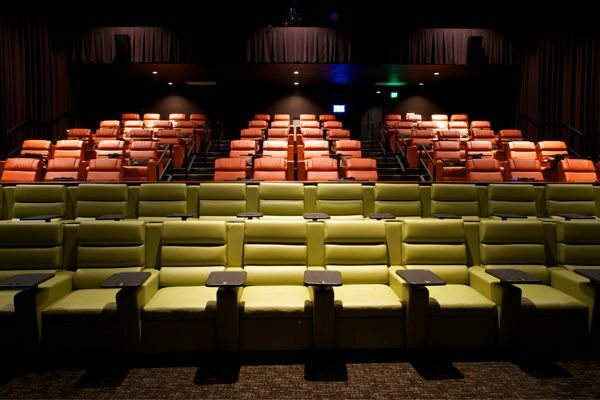 Each iPic auditorium at the Westwood location (and at most of the chain’s other cinemas) are broken down into two sections; Premium and Premium Plus seating, all of which are reserved. Premium seating occupies the first two rows of each auditorium and costs USD $17 for all shows. The leather chairs are more like customary movie theatre seats in that they don’t recline. 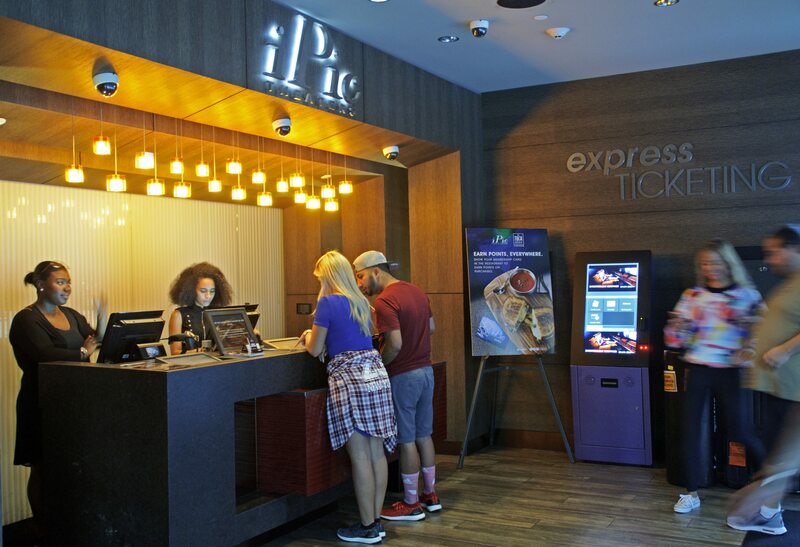 Food or beverages must be purchased from the iPic Express counter before entering. Premium Plus seats, on the other hand, cost USD $17 along with a USD $12 VIP fee for a total of USD $29. (Presumably, the split of the VIP fee from movie tickets is so that iPic won’t have to share this revenue with distributors, unlike ticket sales.) There is no matinee pricing nor 3D surcharges. It’s worth pointing out that even though iPic screens have fewer seats, each is still the size of comparable, traditional auditoriums. The lower seat count is purposeful, part of each theatres architectural design, so that every pair of seats has aisle access for attendants to easily serve food and beverages. Naturally, each screen is equipped with 4K digital projection and 7.1 surround sound, but iPic realizes that such technology is not going to differentiate them from other nearby dine-in cinema concepts. Instead, the company is wisely relying on hospitality, food, ambiance and overall experience. It is best to dispense with any perception you may have of how such attributes might be pulled off successfully by a cinema operator, as they are really what make the iPic Westwood stand out. We’ve already told you how the cinema has a concierge, a position usually found mostly in hotels. That should give you some indication how iPic is handling some of its other trademark amenities. 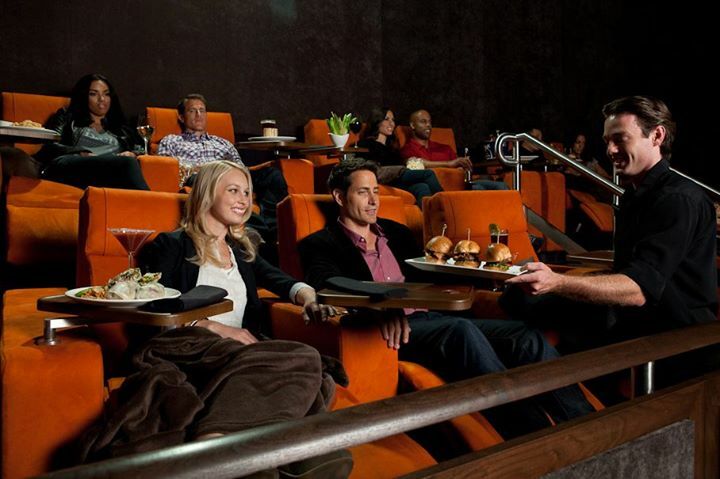 Like at Alamo Drafthouse, a pioneer in the dine-in cinema space, the food and beverage offerings are not afterthoughts at iPic. Far from it. The iPic Westwood has two purpose-built kitchens; one for the cinema and one for the adjoining restaurant. We’ll come back to the latter. First let’s go through the in-cinema menu. What’s unique about the food served in the auditoriums, before and during movies, is that it is “finger friendly”. The eight starters vary from USD $14 to USD $16 and include choices like spicy tuna on crispy rice, warm ham and cheese biscuits and a fritto misto with calamari and shrimp. Ten entree items are priced from USD $14 to USD $19. 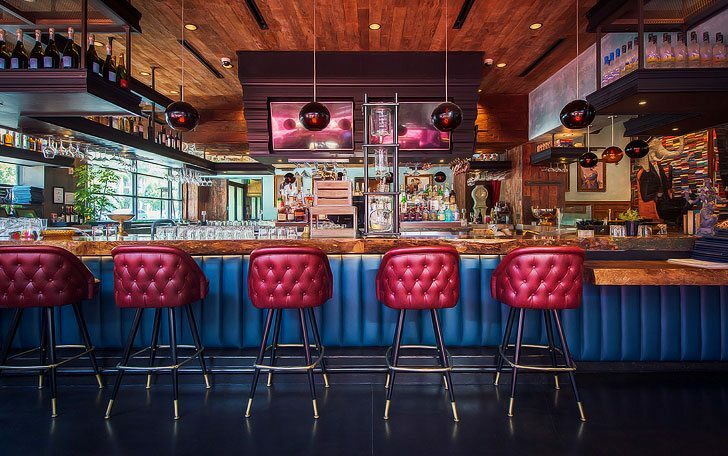 There is mahi mahi fish tacos, chicken caesar romaine boats (easier for picking up), buttermilk fried chicken, an angus burger, a pulled pork grilled cheese sandwich and even a lobster roll. One of the four pizzas on the menu is named ratatouille pizza and is topped with green and gold zucchini. If you just want a nibble you can choose from little dishes like a plate of artisanal cheeses or charcuterie. Oh yes… there’s popcorn too, along with truffle fries and sweet potato fries. If you have a sweet tooth, try one of the six desserts. The frozen apple pie a la mode ice cream cup and the chocolate s’mores cake sound good. If you’re not hungry after reading that last paragraph, then either you just ate or may not be human… or possibly both. 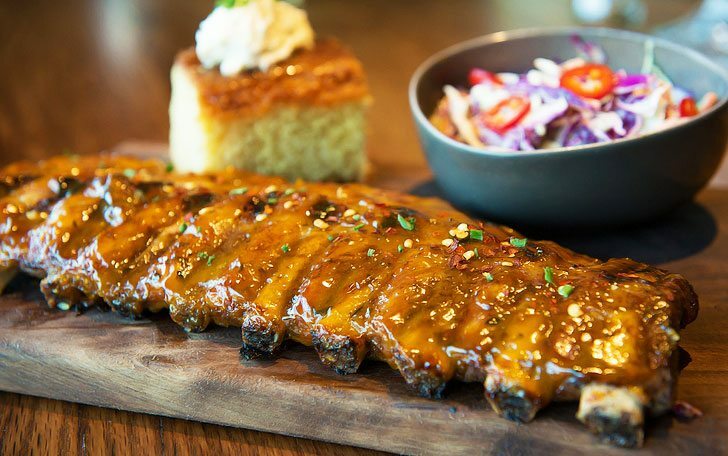 If we have made you hungry and you are anywhere near the iPic Westwood, then we can honestly recommend its adjoining restaurant, the Tuck Room Tavern. When the cinema first reopened in 2014 this restaurant was named Tanzy and served an Italian menu. 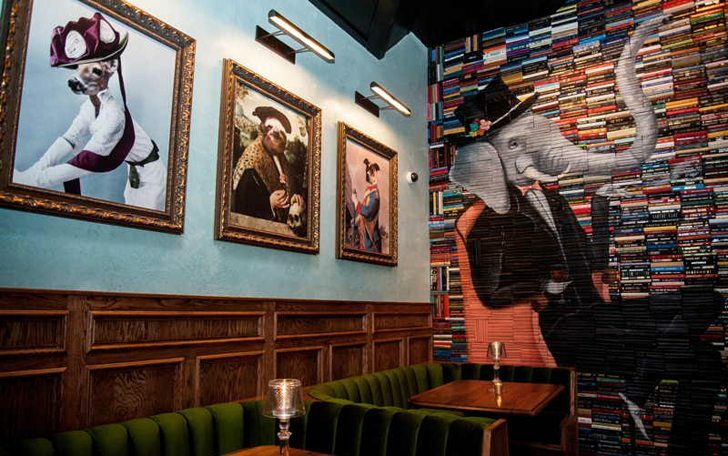 The concept didn’t quite work and was completely revised into The Tuck Room Tavern, which officially opened this month. From the outside, Tuck is given as much curb appeal and signage as the iPic cinema itself. 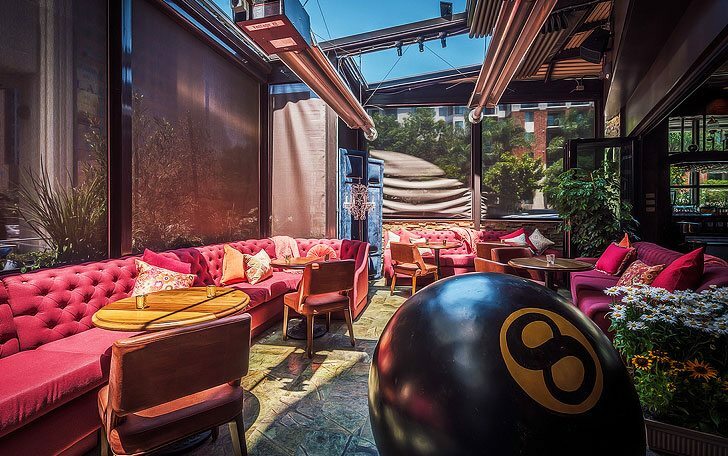 A patio with a retractable roof and wrap-around windows beckons pedestrians from the sidewalk along Wilshire Boulevard. The entrance to Tuck and the iPic are within one or two feet of each other, and if you didn’t know otherwise, you might never know a cinema with six screens was ensconced just beyond the restaurant. 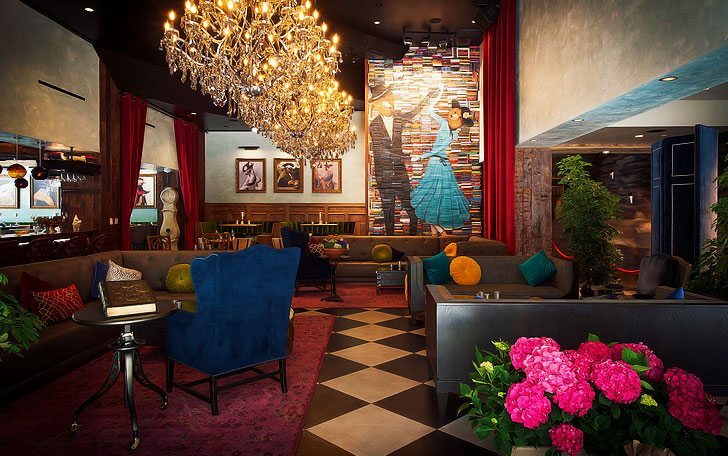 With its three crystal chandeliers, a bar area with lounge furniture and shadow box tables as well as a player piano, the vibe here is more “trendy new restaurant” then “cinema lobby cafe”. Your eye will immediately be drawn to either a giant 8 ball near the patio or a sculpture by artist Mike Stilkey of about 2,000 books stacked floor to ceiling along two walls. Stilkey has hand painted dancing bears and elephants across the recycled books. Sit nearby and you’ll be hard pressed not to spend half your meal staring at any of the visible spines trying to determine which books have been adapted into movies. The closest booth has been dubbed “Booth 50” after a similarly named booth at the Brown Derby, a once legendary, now defunct Hollywood eatery. Our waiter told us that many diners spend a half-hour in the restaurant and bar before heading into a movie. That’s a shame because the food here has a lot going for it. We were told that many of the dishes were meant to evoke “classic Hollywood”. Items such as the reuben croquettes appetizer for instance. Not good for you necessarily, but good nonetheless. 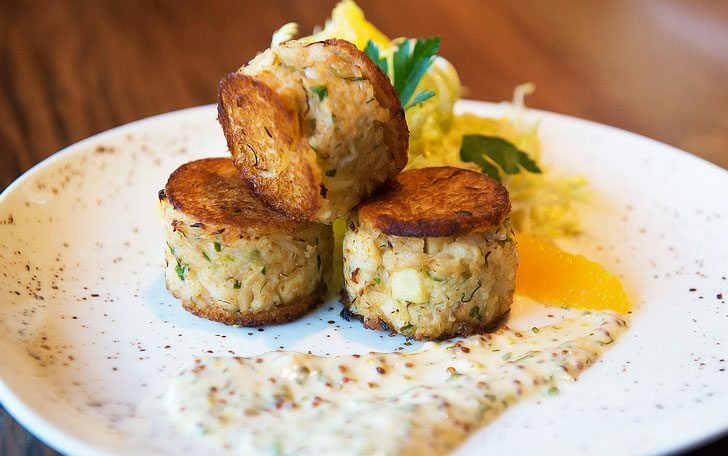 The brioche crusted crab cakes starter will surely become a signature item. As will the mango and habanero barbecue baby back ribs. A 12 ounce ribeye steak is the most expensive item on the menu at USD $36. Entrees start at USD $12 and a selection of salads can be had for as little as USD $11. The cocktail menu was put together by veteran sommelier and mixologist Adam Seger. The Tuck old fashioned is a prime example of Seger’s penchant for using culinary techniques and fresh ingredients to craft his cocktails; it is made with house infused fig and walnut rye, maple and house spiced walnut bitters. The drink goes down a little too easy. The Norma Jean is described as vodka spiked strawberry lemonade, though its appearance on the menu is a bit of an Easter egg. Just 1,000 feet from the door of Tuck is the Pierce Brothers Westwood Village Memorial Cemetery where you can find the gravesite of Marilyn Monroe, whose birth name provides the name for the Norma Jean. Buried nearby are countless entertainment luminaries such as Truman Capote, Gene Kelly, Burt Lancaster, Jack Lemon, Dean Martin, Walter Mathau and director Billy Wilder. Whatever you do, leave plenty of room for desert when dining at Tuck. There are a handful of ice cream choices and four pastry options, each costing USD $9. 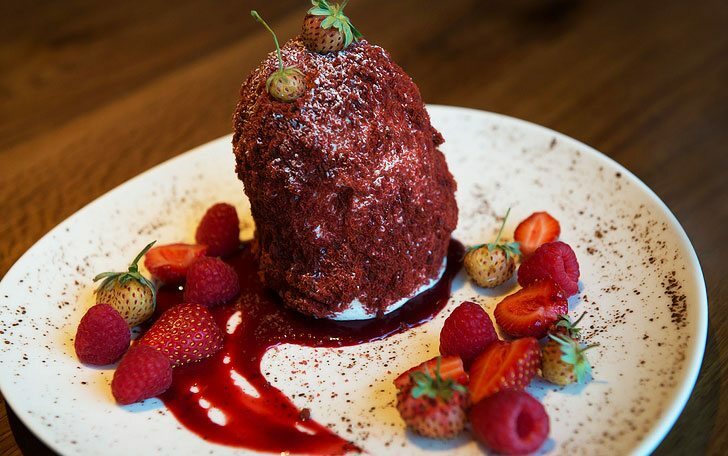 The red velvet pavlova is a favorite with its vanilla meringue, red velvet raspberry ice cream, whipped cream and chocolate sauce. 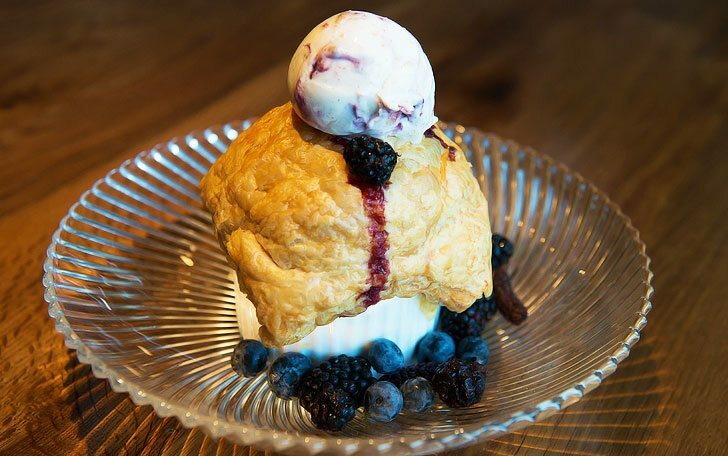 We were not disappointed by the black and blue pot pie; black and blueberries topped by a flaky puff pastry and blackberry swirl ice cream. It was while gobbling up this delicious concoction that a woman wearing a pink chef’s jacket approached our table to ask us how we liked our desert. Our waiter had pointed her out as the pastry chef just a few minutes earlier. She told us her name was Sherry Yard, the corporate chef responsible for putting together the menu at all Tuck Room Tavern and iPic locations. She is soon headed to New York to help iPic open a new cinema and restaurant combo at the Fulton Market. Yard was very kind and generous with her time, leaving us with her card where her title was listed as Inn Keeper. Though a fun title, it may not do Ms. Yard any justice. A quick Google search of her name and we learned that Yard has cooked at Montrachet and Tribeca Grill in New York and is a James Beard Award winning pastry chef. Speaking of awards, Yard spent 20 years as the executive pastry chef for Wolfgang Puck, making deserts for the Academy Awards Governor’s Ball, the Grammy Awards and the Emmy Awards. Besides her position at iPic, she is presently in the process of bringing the historic Helms Bakery back to life. No wonder the blackberries tasted like they came from a farmers market… they actually did. The concierge revealed that guests attending movies at the iPic Westwood average more than four hours at the venue. With a restaurant like Tuck, it’s not hard to see why. And don’t kid yourself that the high cost of admission might be a turn-off or keep audiences away. The chain has more than 1.3 million registered patrons in its membership plan with a median age of 33 and an average household income of USD $190,000. iPic isn’t trying to attract students from UCLA, located on the other side of Westwood, but is looking for the young professionals working in the office buildings along Wilshire Boulevard to the west or alternatively the empty nesters living in the high rise million dollar condominiums lining the Wilshire corridor to the east, a stretch of road leading into Beverly Hills known as The Golden Mile. Surely if making moviegoing more experiential is essential to the survival of cinemas, as many in the exhibition community have proclaimed recently, then iPic may have perfected their recipe as the company’s Westwood theatre demonstrates.